This post is completely inspired by my brother in-law Dr. Nathan Hnatiuk who teaches Organic Chemistry at Cedarville University. Nate just posted a fun organic chemistry rap video on his Facebook page and I thought it was worth passing along to others. The video is embedded below. You might also like this AP Chemistry rap video. 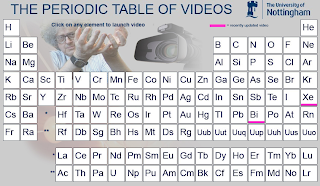 And here are five resources for helping students learn the Periodic Table. Glaxo Smith Kline's Active Science offers fifteen interactive games covering a range of science topics. The Interactive Periodic Table is a game designed to help chemistry students practice identification of the elements. To play the game students are given some clues about an element's properties. Using those clues the student has to place the element in the correct place on the table. The Dynamic Periodic Table is a good resource for science teachers and their students. The Dynamic Periodic Table works like this, click on an element and a window will pop up to tell you more detailed information about that element. The pop up windows cover properties, orbitals, isotopes and more. There are even links to more information, like the history of each element, for each element. If this had been around when I took chemistry, I might have done a little better.